To build a DSS or EIS in an organization, it is important to understand the organisational environment in which it has to be functional. The environment here can be explained as the available hardware, operating system on the computers, approach to link or network computers, users, their work and workload, the links between the departments and information or data flow, hierarchies among the different levels of human resources, their interactivity level, etc. This total setup is covered under Information System Architecture. The architecture of an information system refers to the way its pieces are laid out, types of tasks assigned to each piece, interaction among pieces and interaction of pieces with outside system. Martin (1991) defines information system architecture as “A written expression of the desired future for information use and management in an organization, that creates the context within which people can make consistent decisions”. 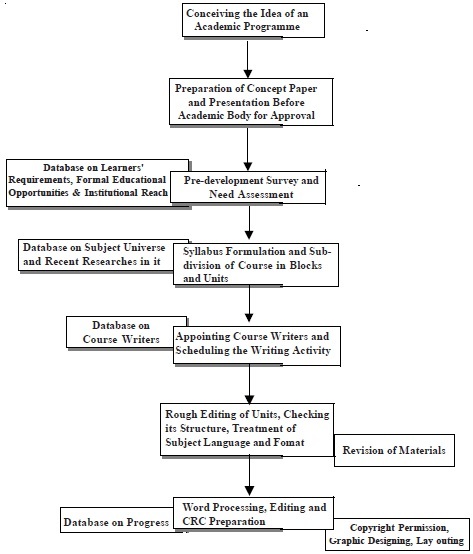 Let us look at the flow diagram (Figure-1) of course development process adopted by Indira Gandhi National Open University for generating a course as an example of information system architecture. We are not explaining the diagram, as it is self-explanatory, but please note the data gathering situations and try to identify the decision making points. 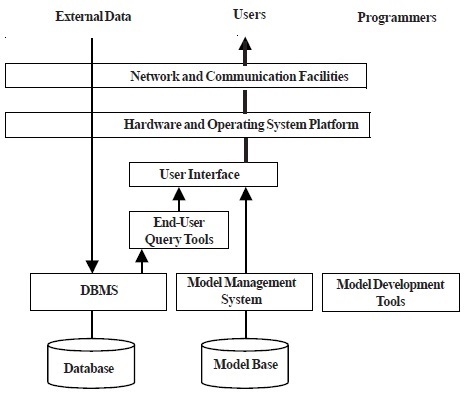 Let us refer to Figure-2 showing generic view of a DSS architecture. a) The traditional System Development Life Cycle (SDLC) approach considers identification of user requirement, analysis of existing system, designing overall system and its designing, development (with simultaneous implementation) and testing. Each of these steps culls a written document, reviewed and approved before starting next step. The basic advantage of this approach is that it covers all the areas and maintains a record of them. On the other hand it is too rigid for a system that is frequently changing or updating. b) Prototype Approach considers user requirement and either applies prototype system design before system design or evolves prototype design after development and exercising a prototype system. In the former style, the implementation of the system design done on the basis of prototype design and development and testing follows whereas in the later approach, while evolving the prototype system or rapid application development all the changing factors are taken care of. The implementation of system is faster in later approach. Both prototype approaches are flexible and responsive to the development process. The drawback in the prototype approach is longer development schedule and possibility of using wrong tool or using the right tool in the wrong way. c) End-user Development approach provides an opportunity for development of DSS by the decision makers themselves. Spreadsheet is a common low-level end-user development tool. The approach provides extensive control of the user on the system including target schedules and problem understanding-solving environment. The DSS project development is teamwork where each team members has definite role to play. The members of the team are the users, responsible for solving the problem that the DSS is to help with, the intermediately, who help the users of DSS, the DSS builder, who are technical experts and have technical decision making power on the hardware, the technical support person, who are programmers integrating existing packages into overall system and do customized programming, and the toolsmith, who uses tools to be used in constructing the DSS. Having had the defined approach and the team in place, who have already completed the tasks of need assessment and software selection, the following step may be useful in building the DSS (Mallach). h) Transferring ongoing responsibility for the system from its developers to the operations or maintenance part of the MIS group; and i) Evaluating the operations and use of the system.